Microsoft hasn’t released a single smartphone since February 2016 but this doesn’t mean the company isn’t working on mobile devices. Multiple reports and patents have suggested that the company will embrace the new foldable smartphone concept eventually. And now yet another patent backs this theory up. Filed back in August of 2017 and published earlier today, the new patent describes a smartphone with two displays and a small hinge that allows it to be folded completely flat. The hinge mechanism also includes a lock which activates when the dedicated lock button is pressed. This allows the display to be held in one position permanently, which could be useful in certain situations. For example, one portion of the display could be used as a kickstand (visualized in the concept image above). Alternatively, users could choose to fold the device at a 90-degree angle, allowing the upper portion to be used for viewing and the lower area as a keyboard. When the device isn’t in use, it can be folded in half and locked in that position. Additionally, as Microsoft notes in the patent, it should be able to fit in the user’s pocket. As this is just another patent, there is no guarantee Microsoft will ever release such a device. But considering the number of filings, it appears the world’s most valuable is at least researching the idea quite a bit. So there’s certainly a chance such a product will eventually be announced. Microsoft might actually be able to come up with really good software for this, but app support will probably be terrible like their other products. Why would it be terrible? A device like this could run full Windows. So that means it would get plenty of app support. A MS device like this running Windows will blow any ARM device out the water as far as capability. The Surface is a better tablet than anything running on ARM. But if MS has finally perfected Windiws on ARM, and now Qualcomm has a chip fast enough to run it, we already seen you can run native x8664 on ARM with no priblem. Apple needs to take note But against they are gonna come late and reap all the benefits of copying. Yeah yeah. We've heard about this for the last six years or so. My advice to Microsoft: actually make something. But in true Microsoft fashion the competition will beat them to market. Someone is always gonna be first, that doesn't mean it has to be you. Time and time against it has been shown that rushing to be first have given halfbaje concepts that failed. Being 2nd means waiting for w new product to have all its bugs worked out, so you can offer a more elegant and useful experience. Microsoft failed with Windows Phone simply because they half-assed it. It's just that simple. And to try to change devs for that garbage was a total insult to my intelligence and that's why they didn't get support. For this device if and when they ever make it, to have any success; it will need to be able to run Windows. Anything less is a failure because Android and IOS already offer this AMD devs are not gonna invested in a 3rd platform. They've already shiw this. It is expensive to dev for multiple platforms that keep changing. The main reason Nokia should have chosen Android from the beginning. Sometime being last has a better advantage. Give you a chance to think if what they didnt. Own a business and then you will understand. Sorry to say but fruit company does not count anymore innovation wise. They loose every time, everyone knows that Chinese phones are the future for the coming years. I think you didn't catch my sarcasm... the tablet is bend prone due to bad design. Jerryrigeverything made a video about it, it's painful yet entertaining to watch. For the naysayers who think folding tablets is some gimmicky throw to the wall and see what sticks concept; a folding tablet or phone can offer sole benefits. And duh, anyone buying it knows it's not as then as a smartphone. So what. That isn't its point. The original BlackBerry wasn't meant for normal everyday consumers, but people were buying them to the tune of 300M. I would love to have a Galaxy Note sized device with dual displays. Have a bigger display for movies and productivity and a single when I news simply things like SMS or taking pictures. This is gonna be another concept that could turn into a big deal, especially one running full Windows on SnapDragon 81xx series or better. Microsoft. Please don't name it Surface or Viv. 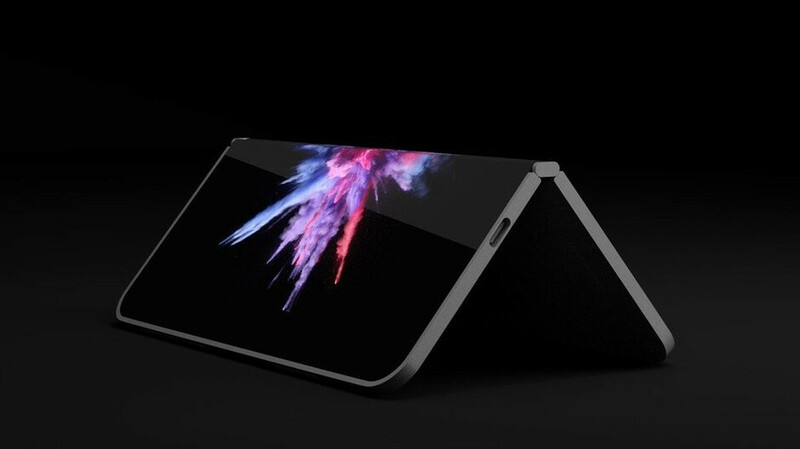 Foldable phones will a true future proof concept but for msft it will be hard to compete against google fushcia os and apple ipad ios when that time arrive if andromeda device with windows 10 core os gets successful with proper support and apps developers for it platform. Does this mean that MS would come back to compete in smartphones competitions, or just want to create a patent and rent to other companies?